Many years ago, I went on my first backpack trip as a mature adult. Well, the "mature" part might be debatable but anyway, I showed up with a pack that must have weighed at least as much as a blue whale, or so it seemed. Overly heavy to be sure, but I was prepared for every conceivable calamity ranging from earthquakes to a rabid moose bite. My friend Ned Landis, with nothing but kindness in his heart, went through my pack and offloaded a lot of that unnecessary weight. Even so, the pack was too damn heavy. From that fateful trip, I did learn one lesson that still stays with me to this day: weight does matter! Nowadays, I get mad at myself if my pack is over 30 pounds and just like Ned did so many years ago, I go through newbie's packs and remove stuff and preach the gospel learned on that fateful trip "Weight does matter!" Newbies tend to overpack just as I did on that fateful first trip, it is up to us grizzled veterans to demonstrate our lighter packs and total backpacking knowledge and general all-around awesomeness. That's why it was disconcerting when newbie Kevin showed up with a lighter pack than both mine and Dale's. We were both showed up by a rookie! Although this trip consisted of five days in the Diamond Peak Wilderness, the hike got off to a decidedly non-wilderness feel when right at the start we crossed several railroad tracks, our heads swiveling back and forth as we kept a watchful eye out for any speeding trains. The tracks concluded the civilized portion of the hike as just on the other side, a wooden sign marked our entry into the wilderness. The Yoran Lake Trail initially climbed gently through a beautifully greened out forest. Trapper Creek was full of water and was running fast with spring snow melt. The mosquitoes weren't too bad and we enjoyed our nice little forest stroll. After several miles, the uphill slant increased in severity as the trail gained elevation. Pretty much all 8 miles of the first day's hike was spent plodding uphill. Just as we were starting to get bored with viewless forest, the trail did a walk-by past an unnamed lake, Karen Lake, and then Yoran Lake, each lake larger than the one before. Yoran Lake in particular provided us some wow with a great view of snowy Diamond Peak looming over the body of water. The mosquitoes increased in number and became generally annoying but not voracious enough (yet) to make us lose our sanity. I'm following Richard, I better check my GPS! We had been hiking on the Yoran Lake Trail and the trail ended at its namesake lake. 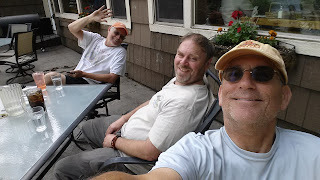 It was a little bit of a problem because our route required us to be on the Pacific Crest Trail which ran almost a mile to the north and was slightly uphill from Yoran Lake. Armed with compass and GPS we left the trail, following Yoran Lake until there was no more Yoran Lake to follow. Continuing northward beyond the lake, we bushwhacked through the forest, placing an inordinate faith in all our electronic navigational gadgetry. Exactly according to plan, we popped out of the forest at scenic Lils Lake and one short uphill bushwhack spit us out of the forest and onto the Pacific Crest Trail. All total, the day's hiking would gain over 2,100 feet of elevation with a substantial amount of the total gain taking place on this section of the PCT. In short, it was a tedious slog up to a pass below Mount Yoran, Diamond Peak's immediate neighbor. All that uphill became a very steep drop to the base of Mount Yoran and Divide Lake, our home for the night. Just a small, seemingly unremarkable lake but Divide Lake is all about location, location, location! The lake is strategically situated at the base of Mount Yoran and the view of both lake and mountain was breathtaking. Camp was pitched on a rocky bluff overlooking Divide Lake, to the accompaniment of thousands of buzzing mosquitoes. Dale discovered he had forgotten not only his cool hat with the neck shade, but he had also forgotten his spoon. Improvising, he used his Deuce of Spades trowel (which he swears had only touched dirt during its lifetime) much to the perpetual amusement of Kevin and I. If I had forgotten anything, I'm not telling because its my blog and I can write whatever I want to. Newbie Kevin, on the other hand, had not forgotten a thing. Anyway, much merriment ensued along with puns about the trowel doing double doody and how Dale could really shovel the food down, etc. All that steep drop down to Divide Lake made for a big climb back up to the Pacific Crest Trail; might as well get the hard stuff done first thing in the morning. Our reward for returning back to the PCT was a relatively level trail and some world-class scenery as the venerable trail contoured below the massive rock wall of Diamond Peak. The easier walking was much appreciated, coming as it did after a tough hiking day. This was my favorite part of the trip. The PCT undulated gently in slow rolling ups and downs through an alpine rock garden. Snow drifts covered the trail and small tarns collected snow melt just off trail. Penstemon and partridge foot bloomed between rocks as we walked through miles of delightful rock gardens. Nascent streams trickled musically across the trail, the crystalline clarity of the water entrancing passing hikers. And always, Diamond Peak, its rocky crags flecked with snow, loomed above the trail. Kevin admitted that on the Day 1 slog, he wondered why he had volunteered to come along, but it all made sense on Day 2. We pretty much had the PCT to ourselves although we did run into two scrawny ladies doing a marathon trail run and one backpacker who'd been hiking since starting at Mount Shasta about a week prior. Speaking of Mount Shasta, amazingly we could see the peak on the horizon as we rounded the south end of Diamond Peak. The sky was cloudy and it felt like rain was coming, yet there was Shasta, faintly visible from a mere 145 miles away! Other peaks nearer and dearer to us Oregonians were eminently visible from the PCT: Middle and South Sister, Maiden Peak, Cowhorn Mountain, Sawtooth Mountain, Union Peak, Mount Thielsen, and Mount Bailey. Sounds like a roster of my blog posts over the years! A trail junction past the southern end of Diamond Peak was our cue to jump off the PCT and take a side trail to Rockpile Lake. Nearby Marie Lake gets a lot of backpacking love as it's the logical starting point for those climbing up to the top of Diamond Peak. However, stunningly colored Rockpile Lake is much more scenic and we had the place to ourselves, although the mosquitoes drove us into our tents well before the sun went down. Day 3 of a 5 day trip marks the halfway point and as such, is that cherished and special day euphemistically referred to as Clean Underwear Day! Clean underwear is not overrated and let's just say we left Rockpile Lake with buoyant enthusiasm engendered by the wonderful sensation of freshly laundered clothing "down there", to put it delicately. It was an uphill trudge for the first couple of miles on the hike away from the Pacific Crest Trail. After cresting a broad rise, a rest break was taken at the aptly named Mountain View Lake. There was a mountain, there was a view, and there was a lake. Seriously, the little lake provided an awesome vista of snowy Diamond Peak rising above the waters. After a short view soak, it was then all downhill for the rest of the day. As the trail lost elevation, the scenery transitioned from all that wonderful alpine wonderland to dull, drab, and dusty lodgepole forest that was singularly uninteresting. The main excitement on this part was reaching the Whitefish Trail which then delivered us to Diamond View Lake, our home for the next two nights. It had been a short 6.7 mile hike to Diamond View Lake so there was plenty of time to kill. Kevin and I sat by the lake all afternoon, cameras clicking all the while, If anything, the view here of Diamond Peak was even more scenic than the view at Mountain View Lake. The sun eventually sank behind the mountain and more camera clicking took place with the advent of a spectacular sunset. There's a "Leave it to Beaver" episode where Ward Cleaver takes Wally, Beaver, and friends to the movies. When they exit the theater, they find Beaver is still in the theater. Lumpy goes back into the theater to find Beaver but Beaver comes out and now where's Lumpy? So Wally goes to find Lumpy and Lumpy comes out and then someone has to go find Wally, and so on so forth for 30 minutes. Well, we were ready to start our day hike to Saddle Lake and Dale has to go back and get his GPS. But wait, I have to go back and get my hiking poles. Now, are we ready, guys? Whoops, I forgot my GPS. Even Kevin got into the act, having to go retrieve a hiking pole. Cue the laugh track and cut to commercial! Saddle up, Kevin, we're going to Saddle Lake! Anyway, Day 4's festivities got off to a great start (once we actually started!) with Diamond Peak reflecting on the mirrored surface of Diamond View Lake in a quintessential postcard view. If every day of the rest of my life started out like that, I'd probably be much easier to get along with. Our itinerary for Day 4 was a short day-hike to aptly name Saddle Lake, which sits on a forested saddle between Peak 6982 and Redtop Mountain. It was a brisk climb away from Diamond View Lake and we were all glad we weren't toting fully loaded backpacks. Most of the day hike was spent in forest but here and there the crest of Diamond Peak appeared between the trees on the climb up to Saddle Lake. It was a lengthy and enjoyable lollygag next to Saddle Lake, the time spent watching mothy little bug things swim across the surface of the lake. Periodically, large armored beetles with heart-shaped carapaces crawled on us, triggering the occasional "Gah!" moment. The day and lake water were each on the cool side, otherwise we may have gone swimming with the mothy things. Back at camp, we shared Diamond View Lake with some Pacific Crest Trail thru-hikers whose trail names were Bubba Gump and Smiley. Pleasantries were exchanged from a safe distance as they had that certain air about them that comes from way too many miles on the trail between showers, even the mosquitoes laid off of them. And speaking of showers, Day 4 was Bath Day and all members of our party at various junctures waded into Diamond View Lake (sorry, fishies!) to remove trail dust and that certain air about us. Just like the night before, the sunset at the lake was spectacular, albeit cloudier. Much photography ensued while slapping at mosquitoes. Back at camp, our sleep was interrupted by a sick sounding croak emanating from the trees. Dale was sleeping in his hammock and although the croak sounded a lot like Dale, the croaking originated from a point much higher in the trees than his hammock. It was probably a dyspeptic crow, expressing displeasure with our uncommonly clean camp. Day 5 was getaway day and the hike out was about 5 downhill miles. As the path dropped down towards Odell Lake, Trapper Creek showed up next to the trail again as the forest morphed from dull lodgepole to a verdant forest draped with old man's beard. Lupine and beargrass bloomed next to the trail, providing a colorful counterpoint to all the greenery. As usual, we had to step over the odd tree that had fallen across the trail, nothing new there. However, there was a large patch of downed trees that made the trail darn near impassable and we had to snake our way through the branches and trunks, passing our packs forward hand to hand like a bucket brigade from a 19th century house fire. Kevin's pack was still the lightest, darn it. As we continued to lose elevation next to Trapper Creek, the trail tread widened, the ground well-tamped by frequent use in an indication we were nearing the trailhead. And sure enough, after a perfunctory 5 miles, we crossed the railroad tracks that had an Amtrak passenger train parked on a railway siding, waiting idly for no apparent reason. From there, it was off to a real breakfast at Odell Lake Resort where we ate outside so as not to "perfume" the restaurant. And I'm both happy and sad to report Kevin did not fall for the "guy with the lightest pack buys the meal" trick. nice reminisces of Ned, and I remember hiking slowly behind you to make sure you didn't have a stroke. this backpack also brought back nice memories of our little backpack from Odell Lake trailhead to our destination of Yoran Lake. next day we walked toward Diamond Peak, but not so far that we couldn't hike out to Odell Lake again. thanks for the memories. My friend and I are planning on doing this loop this weekend, we are going to do 3 long hiking days. We will start from the PCT near Highway 58. How are the trails once you leave the PCT portion of the loop? Hey Christy...the trails were in excellent shape and well marked when we went. The lower portion of the hike at Diamond View Lake is an alternate route for PCT hikers and gets a lot of use accordingly. Have fun! Great post! I’m about to do this hike. Just curious- what month did you do it? Confused by the presence of all the mosquitos (which makes me think June or July) AND the thru hikers (who don’t usually show up in Oregon until late July or August). Just wondering what to expect in terms of the bugs.... thanks! Got back yesterday! Wow! So beautiful. Ran into some PCT thru-hikers myself, so you were right on. They started mid-March, a month earlier than most. The mosquitos were ferocious, but the beauty was worth it. Enjoy your summer! Awesome, glad you enjoyed the trip, mosquitoes and all!